We asked Josh Spencer, a fellow Tolkien Collector, if he would be willing to share his story of commissioning a custom leather-bound edition of J.R.R. Tolkien’s The Silmarillion, and he agreed! We hope you’ll enjoy learning about the process and what he went through, in his own words. For as long as I can remember, I’ve been in love with books. It’s just in my blood, I suppose. But more recently, I’ve fallen even more deeply in love with leather bound books. They’re absolutely stunning, and when you learn about the work that goes into making the best of them, they’re even more so. Becoming a fairly serious Tolkien collector has done little to curb the romance. I’ve spent many happy, heartbreaking hours browsing eBay and abebooks, drooling over custom bound early editions of The Lord of the Rings and The Hobbit, usually with price tags two or three times greater than I paid for my first car. A ray of hope came earlier this year when I stumbled on to the website of Temple Bookbinders in Oxford. 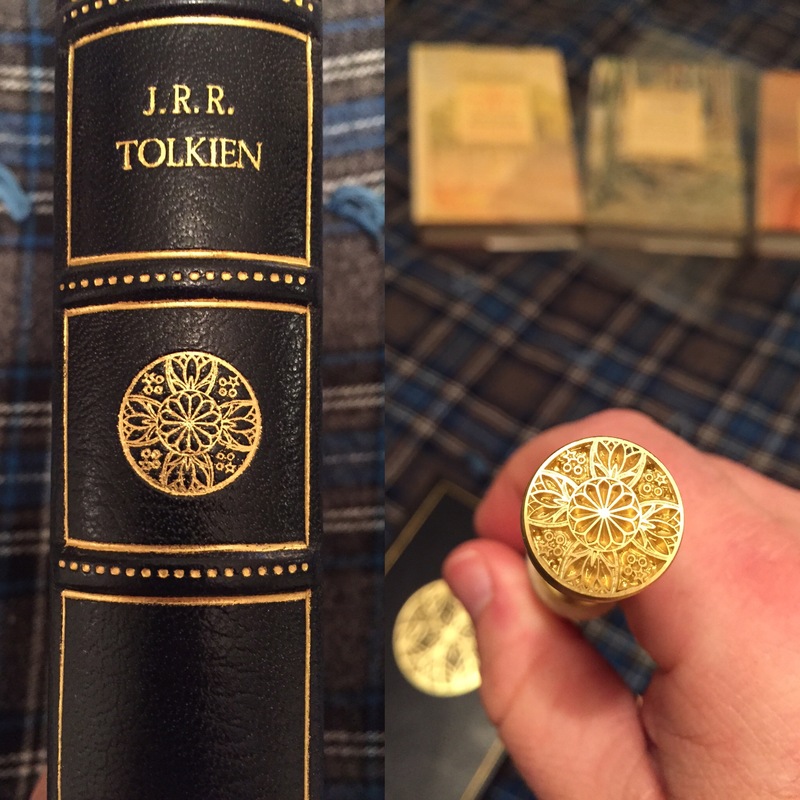 After reading about their various services and drooling over pictures of their work, it slowly became apparent that, while still certainly expensive, owning a custom leather bound edition of one of my favorite Tolkien works was no longer impossible. As with most dreams, though, there were several steps involved in turning this dream into reality. First, you need to find the bindery you want to work with. I was very impressed with the samples I saw of Temple’s work, and the fact that they were in Oxford, the place where Tolkien did so much of his writing, was irresistible. There are many reputable binderies though, both in the US, the UK, and elsewhere. Second, obviously, you have to choose the book you want rebound. I desperately wanted a first edition, and was able to find a lovely 1st/1st of The Silmarillion on eBay for a song. Third, at least in my case, your bindery may ask you to come up with a rough sketch of the design you’d like on your book, both on the spine and front and back covers. 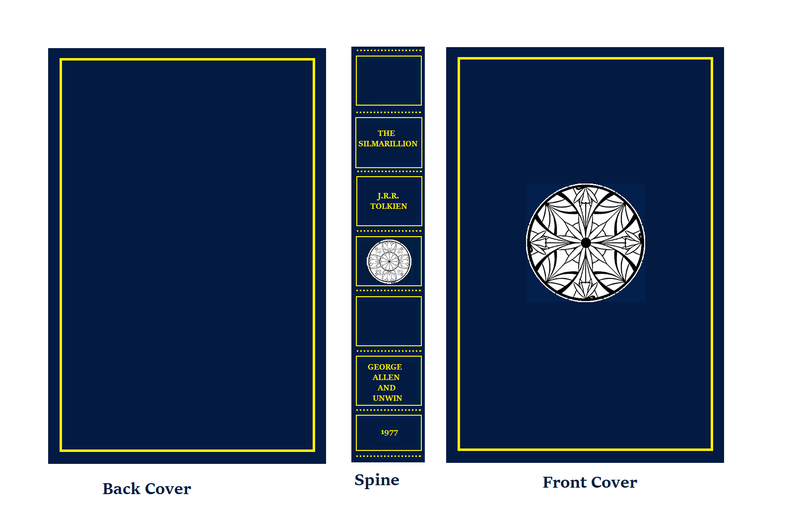 I knew I wanted to incorporate Tolkien’s two heraldic devices for Luthien Tinuviel on the cover and spine, along with Tolkien’s name, the title, publisher, and publication date on the spine. You’ll also want to consider the color and kind of leather you want to use, what sort of end papers you want, etc. Next, you’ll need to get any specialized images you want stamped into the leather vectorized. Yeah, I didn’t know what that meant, either. Basically, it’s the process of converting the images into a specialized format so that they can be used to make the brass dies used to stamp the leather. It took me a while, but I found several reasonably priced sites for this online. Finally, all you have to is send your book off and wait. And wait. And wait. Oh, and then you have to pay. It’s not a fast process, nor a cheap one, but I think the results are worth it. This is our first guest post on Collect A Thing, and we hope to have more in the future. A big thank you to Josh for sharing his story with us! You can follow him on Twitter @foolof_a_took and on Instagram @joshspencer1. Wow getting it bound in leather does ad a distinct visual appeal, but does it reduce the overall value of the book and reduce its collectability? Hi. Just wondering if you could give us a price range for this process? Just a minimum to possible maximum would be really great, and perhaps some links to sites that would do the vectorization process? I’m really interested in doing this but have no idea where to really begin.